Space Matrix, a Singapore-based workplace design consultancy, has worked with a number of companies in Singapore, including MNCs, to understand their workplace needs and provide design solutions that optimise employee needs and productivity. One of its most recent projects here was thebridge, owned by urban and business space solutions provider Ascendas-Singbridge Group. Located on the ground floor of the Ascent building in the Singapore Science Park, the 30,000 sq ft office space serves as an additional meeting, event and workspace for tenants at the Science Park. Local co-working operator Space Mob, part of co-working space giant WeWork, also operates a 14,000 sq ft co-working space in the building. The Ascent building had a lot of underutilised prime space at its lobby and ground floor. 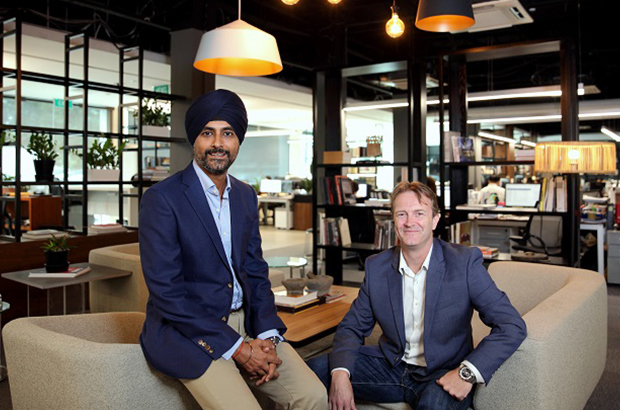 Space Matrix was tasked with revamping the empty space and designing informal gathering areas to help spark collaboration opportunities for tenants, says Ben Breen, Space Matrix Southeast Asia MD. Space Matrix is continuing its business partnership with Ascendas-Singbridge and will design some of the latter’s upcoming co-working spaces in Shanghai, says Arsh Chaudhry, CEO of Space Matrix. Space Matrix was founded by Indian entrepreneur and architect Shagufta Anurag — now its chief innovation officer — in 2001. Today, it has 14 offices in Singapore, Australia, China, India, the Philippines, Thailand and the US. The company has designed workspaces for a wide range of companies involved in the commercial, education, energy, finance, hospitality, information technology and legal services sectors. Space Matrix designed Coca-Cola’s Singapore office when the company moved from Tuas to Keppel Bay Tower. “One of the directions they gave us was that when you enter their office, you need to recognise that it’s Coca-Cola. At the same time, they asked that we not overwhelm the space with the obvious colour choice, red,” says Breen. Space Matrix accomplished this by creating a hand-drawn Coca-Cola mural on the brick wall behind the reception counter and using the “Coca-Cola dynamic ribbon” as inspiration for the overhead creative lighting throughout the space. Chaudhry says Space Matrix plans to approach landlords of older commercial properties in Singapore to help them embark on workplace transformation projects to attract more tenants. Many developers have seen how co-working operators are attracting new tenants into some older commercial buildings in the CBD. They are contemplating how to maximise the underutilised commercial space in their properties, says Chaudhry. “Offering more variable common areas will help make a building more attractive; developers need to seriously consider their options,” he adds.